Ina Coolbrith believed in poetry, in California, and in you. Poetry was seared into Ina's soul when at age eleven she read Lord Byron and Shakespeare under open skies on her way to California by prairie schooner. She began to publish her own poems by the age of fifteen, and within a few decades had become a respected contributor to the Overland Monthly and other literary magazines. Even though she worked full-time as a librarian (which meant 70-hour workweeks), she managed to publish two collections of poetry and to command a dominant poetic presence in the West. When California crowned Ina its first poet laureate during the 1915 Panama-Pacific International Exposition, the gesture made her America's first state laureate. In her acceptance speech Ina told the standing-room crowd that for her poetry was "the supremest of the arts," a "divine gift," and a "labor of love." "Poems are children," she later said. "They are things. There is something supernatural about poetry. You cannot define it any more than you can define love." 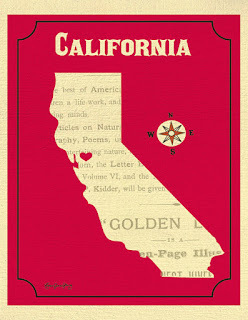 "For California is a poem! The land of romance, of mystery, of worship, of beauty and of song. It chants from her snow-crested, cloud-bannered mountain ranges; it hymns thro' her forests of sky-reaching pine and sequoia; it ripples in her flowered and fruited valleys; it thunders from her fountains pouring, as it were, from the very waters above the firmament; it anthems from the deeps of the mightiest ocean of the world; and echoes ever in the syllables of her own strangely beautiful name—California." She believed in California, and foresaw it would produce exceptional writers. A California-born writer had yet to achieve greatness, she said at end of the 19th century, noting that writers known for their California writing, including herself, had been born elsewhere. “What would I not give to cast a look hitherward a century, nay, half a century hence and read the record of accomplishment along the lines of art, music, drama and letters,” she said. Ina would have been pleased to know that Dana Gioia, California’s current poet laureate, was born here, and has visited and read poetry in every county of California during his term. Ina encouraged many writers including Jack London, Isadora Duncan, Mary Austin, and George Sterling. I believe she would have encouraged you, too. She had a premonition that you would arrive—by birth or by car—and write about California. Ina honored the past, lived in the present, and gathered sparks from the future, dogmas that are still held today by the Ina Coolbrith Circle, founded by their namesake in 1919. She was proud to be one of the West's pioneer writers, and benefited by the inspiration that comes from living on the edge of a frontier. "A new country is virile, and like youth, is adventurous and unafraid. It makes for originality. It is radical… Always there is a golden fleece to be found in a new land." A landscape and a place can also be made new by cultural shifts. Today, California is new again. We don't live in Ina's California, and we don't live in the same California we were born in. The world is changing—ever changing—and in each metamorphic state it is virile again. Be adventurous, unafraid, and radical. Ina would have loved that. This essay originally appeared in The Gathering 13, the Ina Coolbrith Circle 2015-16 poetry anthology. I will be speaking about Ina Coolbrith and San Francisco, her city of love and desire, at The Book Club of California on Monday, January 22, 2018.